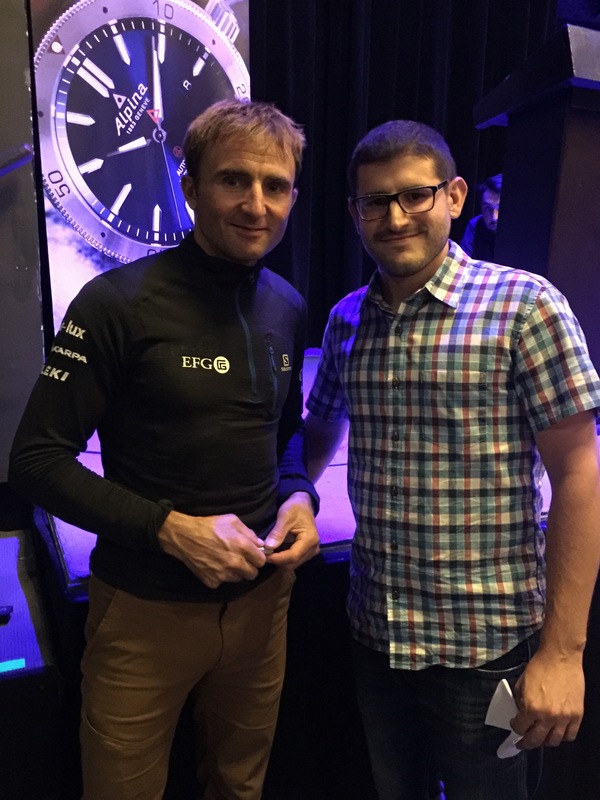 As an everyday adventurer the chance to meet a big mountain super star like Ueli Steck does not come along very often. 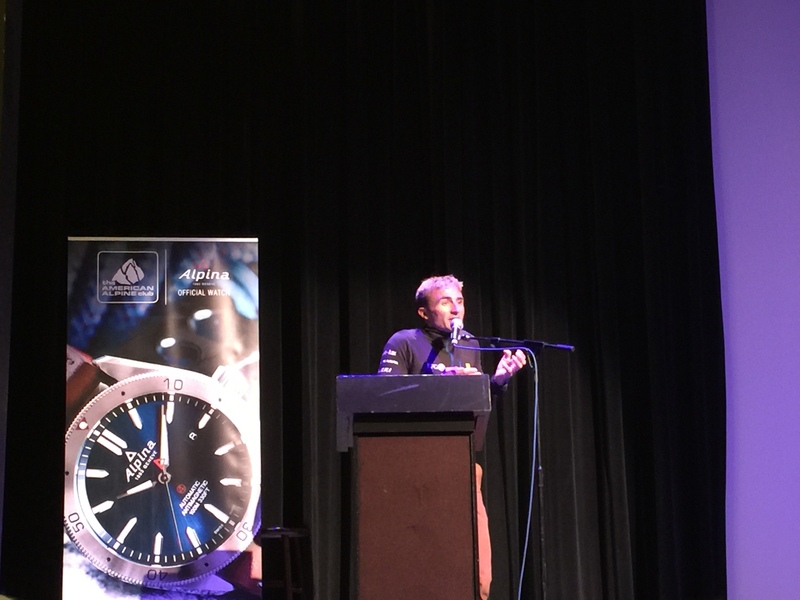 So when I heard that the American Alpine Club (AAC) in partnership with Alpina Watches was sponsoring a speaking tour with Ueli Steck, the Swiss Machine himself, I just had to buy a ticket. It also didn’t hurt that the first night of the tour was being hosted so close to home in New York City. Since I first heard about Ueli Steck when he set the speed record on the Eiger North Face in a staggering 2:47:33, solo no less, he has been a huge inspiration to me. Those that follow my blog regularly know that I have always had dreams of climbing big mountains, and hard alpine lines so for me Ueli is a bottomless pit of inspiration. I won’t recap his entire talk because I don’t want to spoil the show, but I thought I might touch on a couple of topics that I thought really captured my own feelings about what climbing is and the motivation that drives even us everyday adventurers to get out into the mountains and attempt bigger and better things. Which leads me to one of the other major themes of Ueli talk, which is how he deals with the disappointment of not reaching the goal you set out to achieve. Most of us go out into the mountains with a particular goal in mind, whether it is to climb a route you have never done before or bag a new peak, but sometimes things just don’t go according to plan. Maybe the weather turns, you just don’t have any juice left, or when last nights all you can eat Mexican buffet seems like a bad decision. These are things we all experience at one point or another, but it is how we deal with these setbacks that really defines us. Ueli ran into plenty of stumbling blocks on his journey to climb all 82 4,000+ meter peaks of the Alps, and even had to turn back not once, but twice on 8,027 meter Shishapangma in the Himalayas less than 100 vertical meters from the summit and these are just a couple of examples. Most of us would be crushed by not reaching the summit after putting in so much time and effort, but not Ueli. Instead he saw the glass as half full. He had climbed two routes he had never done before on the South Face of Shishapangma and in bad weather no less. The realization that he could climb a face on a 8,000 meter peak in bad conditions was a milestone he could be happy with, even without reaching the summit. Ueli also has a great attitude in general when it comes to expeditions, instead of just sitting in the tent lamenting bad weather, he got up and climbed smaller surrounding peaks and even found some fun bouldering near by. This is an approach I have tried to adopt in my own adventures. Sometimes things don’t go exactly to plan but that doesn’t mean there isn’t fun to be had. Sometimes it is just about experiencing new things and making your own adventure when things go south. We all have our own stories about attempting something new and coming up a little short. I can think of one time in particular when I climbed the northeast ridge of Pinnacle Buttress on Mount Washington with eyes on reaching the summit afterwards. My partner and I started early, hiking in 4 miles to the base of the climb before ascending all 7 pitches of the climb in perfect weather conditions. The day was going awesome and we had made great time on the ascent. However, as these things go, just as we topped out on the route clouds began to roll in over the mountain. Since it was only another couple of miles up to the summit we decided to give it a go since we had already come this far and up to this point the weather was still holding well enough. As we worked our way up the final slope of the mountain it was as if someone turned on a faucet and we just got completely hammered with wind and water. Being stubborn climbers we pushed on like this for a little while longer before deciding, just a few hundred vertical feet from the summit, that it was time to turn around. It wasn’t an easy decision, but it was the prudent one and I’m glad we did. The weather never improved and we had a good long walk out in the dark. It would be easy to look at this experience as a failure, but we had climbed a route we never did before, and even made it pretty far to the summit in horrible conditions. We could walk off the mountain knowing that we gave it everything we had and in the end that was more important than actually reaching the top. In the climbing world we often think the real value in a good hike or climb is the suffering we endure as part of the process. We are proud of our epics. But we can all recognize there’s a point where the “suffering” no longer adds value. Pushing toward the summit on that day on Mt Washington would have subtracted from my experience and the risk would have outweighed the reward. In the end, I pushed myself, I tested my resolve, I grew as a climber and a person and that is a lot to be proud of! I realized that it wasn’t all about tagging the summit- it was about connecting to the world around me and exploring the limits of my abilities. Ueli’s talk was very inspirational as well as entertaining. I left the theater with a better understanding of who he is and his unstoppable drive to accomplish bigger and better things. I hope to one day accomplish my own big mountain goals, and listening to the advice of the giants who came before is a good way to set myself on the right path. 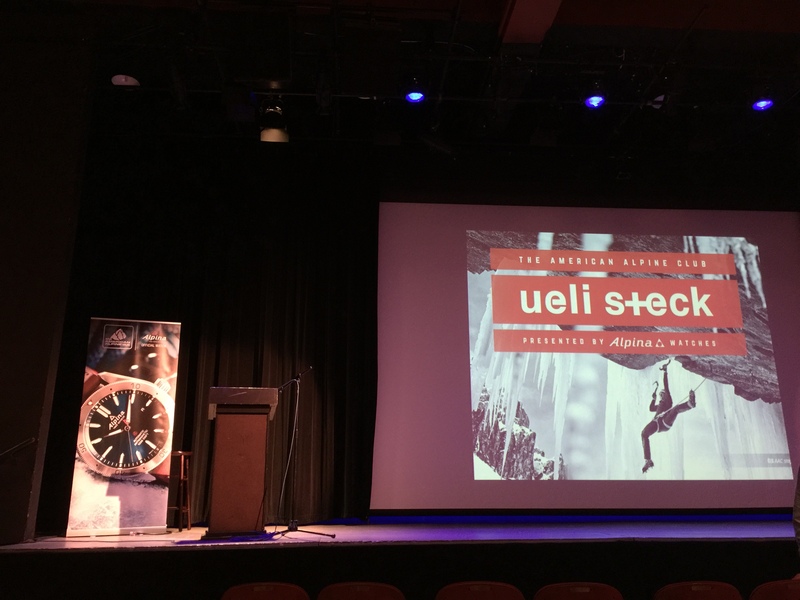 If you happen to live close by to a city hosting one of the upcoming stops of the Ueli Steck 2016 Tour I would highly recommend you attend, it is certainly worth it. A full list of upcoming shows and additional information about the event can be found on the American Alpine Club’s website HERE.